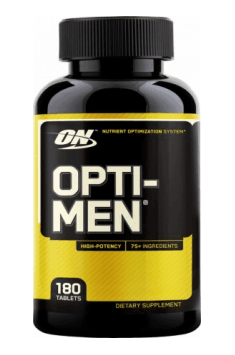 Optimum Nutrition Opti-Men is an advanced supplement promoting the health of the male body. The formula contains a blend of key vitamins, minerals and nutrients. Their effects are enhanced by fruit and vegetable extracts and unique blend of botanical extracts.Taking into account the needs of physically active men, the supplement has been enriched also with a blend of amino acids. The product provides a perfect basis for normal functioning of the body. It supports all the most important systems and organs of the body. It strengthens the heart, improves digestive function, regulates endocrine function and has a beneficial effect on genitourinary function. Furthermore, it helps improve your mental condition and boosts the resistance to stress. Physically active men may also expect increased endurance, faster muscle growth and better recovery. The formula is a source of all essential vitamins and minerals. Their adequate doses help make up potential deficiencies and maintain their adequate levels. This group includes: vitamin A in a double form, which is vital for vision, vitamin C for improving immunity, vitamin E with antioxidant properties, vitamin D and K, which strengthen bones and regulate calcium circulation, and full complex of B vitamins that optimise metabolism and are essential to the nervous system. The mineral blend combines popular elements such as magnesium, calcium, zinc and selenium with unique trace minerals. It is worth noting the content of iodine, vital to the thyroid, copper, promoting collagen production, and manganese that is an important element in hormone synthesis. The supplement contains also two minerals which are required especially for the male body: molybdenum (prevents goat, a disease which affects primarily men) and boron (promotes an increase in free testosterone levels). Scientists have proven that it improves the transport of nutrients into muscles, thereby helping increase their volume). The supplement comprises a unique complex of fruit and vegetable extracts which is characterised by high nutrient density and is naturally rich in vitamins, macro- and microelements and heath-promoting compounds (e.g. polyphenols). They are derived from a natural source and that is why they are better absorbed and more bioavailable than their synthetic counterparts. The manufacturer has taken into account that the formula will be targeted primarily at physically active men. They are in a group of individuals with increased requirements for nutrients, vitamins and minerals and who are more likely to take supplements. In response to their needs, the supplement’s composition has been enriched with branched-chain amino acids that are accompanied by glutamine. They provide effective protection against catabolism and stimulate anabolic processes. They have a very beneficial effect on post-workout recovery. The supplement contains also a blend of extra ingredients with great health benefits and valuable nutrients. This group is represented by alpha lipoic acid, a strong antioxidant, choline, essential to brain tissue, lutein, responsible for normal vision. It includes also inositol, which improves fertility, and lycopene and rutin with a protective effect on the heart and circulatory system. To sum up, Optimum Nutrition Opti-Men is an extremely complex formula which supports comprehensively the male body, helps improve your mental and physical health and adds energy. The supplement is recommended especially to men who do not follow a healthy diet, drink often alcohol or are addicted to nicotin. It will also work perfectly for men who overload the body with physical or mental activity. Take 2-3 tablets a day with a meal. Essential vitamins and minerals, enriched in amino acids and plant substances supporting the health of men concentrated in one capsule. The preparation should be taken with meals in order to ensure optimal absorption. Stearic Acid, Magnesium Stearate, Silica, Croscarmellose Sodium (disintegrant), Microcrystalline Cellulose, Maltodextrin, and Pharmaceutical Glaze.